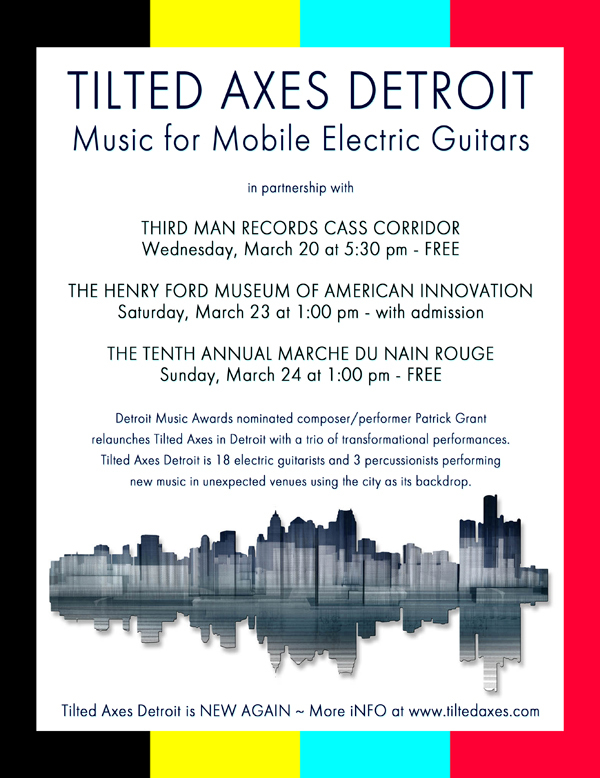 POST-ROCK COMPOSER PATRICK GRANT RETURNS TO DETROIT WITH HIS TILTED AXES: MUSIC FOR MOBILE ELECTRIC GUITARS PROJECT IN A TRIO OF PERFORMANCES COLLECTIVELY BILLED AS “TILTED AXES DETROIT: NEW AGAIN” AT THIRD MAN RECORDS CASS CORRIDOR, THE HENRY FORD, AND THE MARCHE DU NAIN ROUGE. On Wednesday, March 20th (The Full Moon Equinox) The 18-plus musicians of Tilted Axes Detroit will assemble at 5:30pm at Third Man Records Cass Corridor at 441 W. Canfield, Detroit, MI to mark the project’s return to the city. Third Man Records was founded by Jack White in 2001 with locations in Nashville (2009) and in the Cass Corridor (2015). At this event, Tilted Axes director Patrick Grant will welcome visitors at 5:58pm, the minute the season transitions from winter to spring. A short in-store performance by Tilted Axes will follow. Then, during the 6 o’clock hour, Tilted Axes Detroit will perform a musical procession around the neighborhood to celebrate and promote their upcoming appearances at The Henry Ford (3/23) and the Marche Du Nain Rouge (3/24). The group will reconvene at Third Man Records Cass Corridor to complete the performance. This event is free and open to the public. On Saturday, March 23rd at 1:00pm, Tilted Axes Detroit will appear at The Henry Ford as part of Make Something: Saturdays. The Henry Ford (also known as the Henry Ford Museum of American Innovation and Greenfield Village, and as the Edison Institute) is a sprawling history museum complex located in the Detroit suburb of Dearborn, Michigan, and was named a National Historic Landmark in 1981. The museum’s Model I Theme for March is “Collaborate”. In honor of that theme, Patrick Grant will premiere new compositions that emulate an assembly line in full swing during a Tilted Axes procession throughout the museum. The event is open to museum visitors, no extra tickets required. The Henry Ford, 20900 Oakwood Boulevard, Dearborn, MI, (313) 982-6001. On Sunday, March 24th at 1:00pm, Tilted Axes Detroit will participate in the 10th Annual March Du Nain Rouge. Every March around the Equinox, thousands of revelers gather for a parade through Midtown Detroit to celebrate their city. At 12:00 noon, the crowd gathers at the corner of Canfield and Second, right next to Traffic Jam & Snug, for a celebration of Detroit with live entertainment. At 1:00pm the Tilted Axes procession will join the parade down Second to the Masonic Temple. This event is free and open to the public. More about Tilted Axes: Music for Mobile Electric Guitars: Tilted Axes was created in 2011 by Detroit-born, NYC-based composer/performer Patrick Grant. Tilted Axes cuts musical pathways through the urban landscape, turning neighborhoods into their own sonic narratives. Since its inception, Grant has produced a number of Tilted Axes processions in various cities upon three continents. In 2013 Grant brought Tilted Axes to his hometown of Detroit and created a version of the project with a core of local musicians. They have performed in partnership with the DIA, WDET, the Charles H. Wright Museum, The Detroit Historical Society, the 2015 Concert of Colors, and other area sponsors. 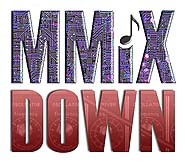 Since Tilted Axes Detroit’s last area appearance in 2015, Grant released an award-winning album of Tilted Axes music as well as other works, one of which was nominated for a Detroit Music Award in 2018. TILTED AXES DETROIT is a project of Peppergreen Media, sponsored by Vox Amps/Korg USA and local partnerships with Third Man Records Cass Corridor, The Henry Ford Museum of American Innovation, and The Marche Du Nain Rouge, with additional support from the DIME Detroit Institute of Music Education, Third Wave Music, and generous private co-producers and tax deductible donations made through our fiscal sponsor Fractured Atlas. A few months ago, Joshua Fried told us about his involvement in a new-ish exhibit at the Connecticut Science Center. AV&C, a systems design firm, worked with the technical folks at Aesthetec on the museum exhibit called ArtJam. It’s a set of interactive sculptures that you can use to make music with friends. Museum-goers get an opportunity to actually compose music in groups, using these objects that light up and create tones and patterns with touch sensitive controls. To ensure that the result of all that tapping and spinning doesn’t descend into mere electronic noise, Joshua Fried stepped in as sound designer/composer to establish methods of emphasizing certain musical elements or weeding out a player’s less than stellar contributions.